Hurrah, at last, a proper night’s sleep. Apparently stern words have indeed been had and it has worked, at least for one night. Maybe they were threatened with abandonment in darkest Russia. Despite forecasts to the contrary, we are able to sit on the solstice deck in the sun – I could get used to this relaxing lark! Plenty of signs of industrial St. Petersburg on shore and swifts flying everywhere. It’s a good job that we allowed plenty of time, as is my wont, to get through customs, which here involves lengthy passport checks and the issuing of paperwork. It is neat that we now know what our names look like in Cyrillic. ‘Green 9’ tour today and our guide is Helen, or Elena, who is Greek. She tells us that St. Petersburg, with a population of over five million, is Russia’s second largest city, after Moscow and that it was the capital until the Russian Revolution of 1918. 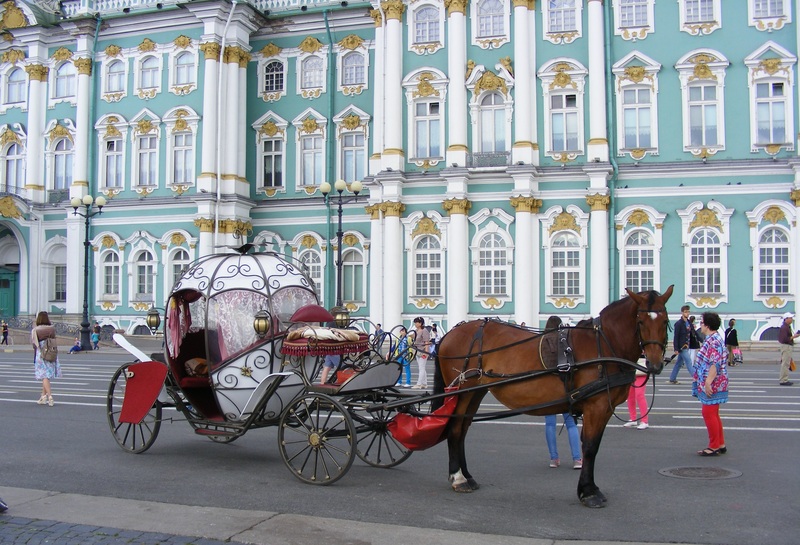 In 1703, the settlement was created by Tsar Peter I, known as ‘the Great’. The city was not named after him but after St. Peter. Initially there was a fortress, the Peter and Paul Fortress – site of tomorrow’s excursion, in the delta of the River Neva. The town soon grew up and by 1712 it was the capital. St. Petersburg is known as ‘The Venice of the North’ and is built on canals and rivers; there are 42 islands and eight canals or rivers round the city. Peter’s original plan was for it to resemble Venice more closely but problems with flooding prevented this. The River Neva was a key trading route, making the site geographically important. The wooden building of the original city meant that cigarette smoking was only allowed on one particular bridge in the C19th. We learn that June is the month of ‘White Nights’, with very little darkness. 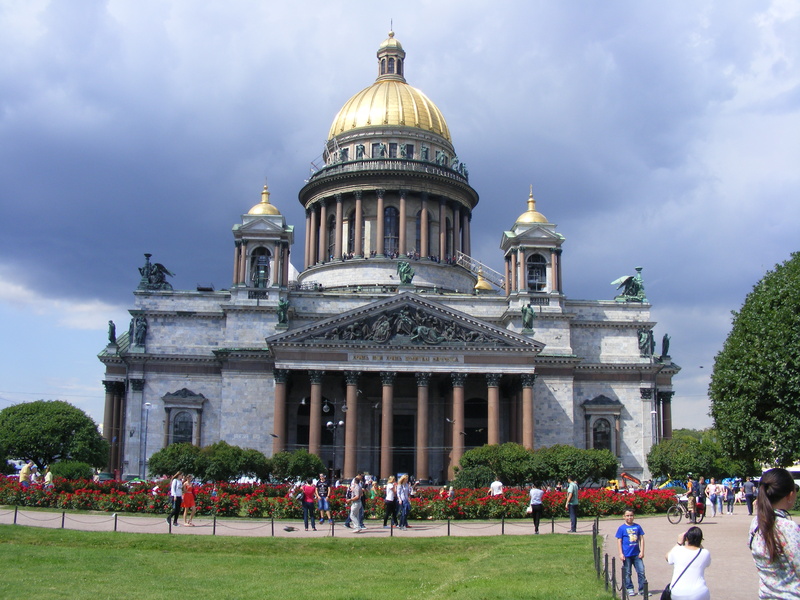 Our first stop is at St. Isaac’s Cathedral, with its impressive gilded dome, which is a landmark all round the city. 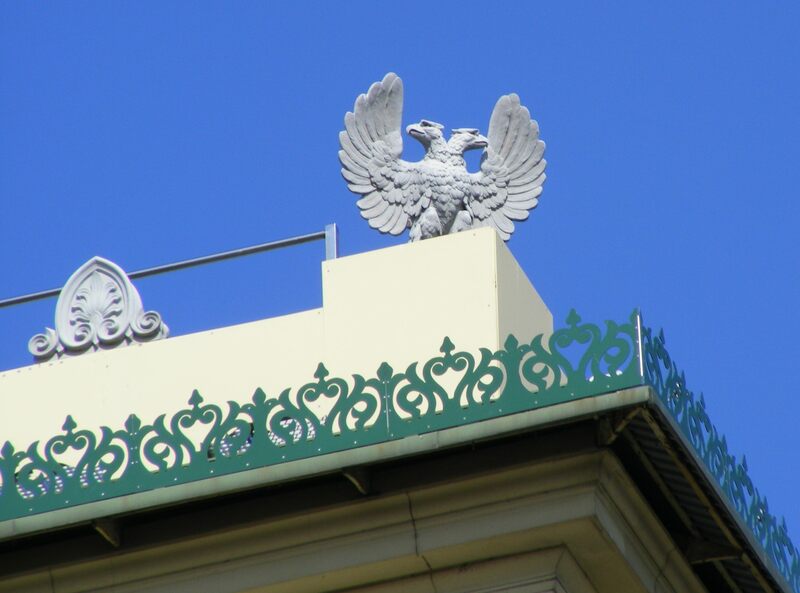 Built in 1818, it has not been re-gilded since the 1850s. St. Isaac’s was built after the Russians beat the French in 1812, in an attempt by the Russian royal family to impress. 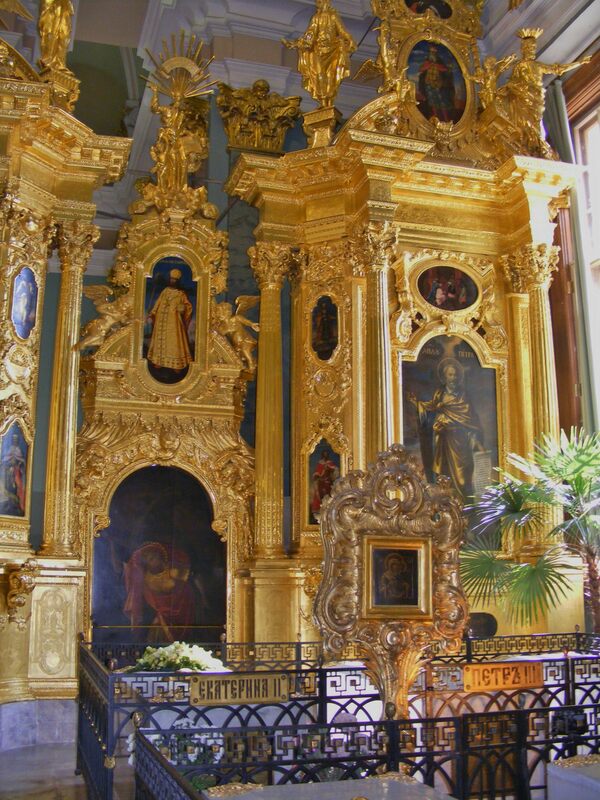 It is a Russian Orthodox Church, so there are no pews. It is the fourth highest cathedral in Europe, took forty years to build and has 114 solid granite columns weighing 100 tons each. The weather is sunny but the forecast is less optimistic and there are some dark clouds looming. Our guide says that the locals normally wear many layers of clothing to cope with the changeable climate; giving rise to the expression, ‘you look like a cabbage’. I guess that is the equivalent of being a Michelin man in the UK. We see a monument to Nicholas I, sited on a 100 metre wide bridge. The bridges are all open at night to allow vessels through but it does mean that then there is no way of accessing some islands. There are also many monuments to Peter the Great and we cross through Alexandra Gardens to see one. Peter was responsible for bringing coffee and potatoes to Russia and is also known as the father of the Russian navy. 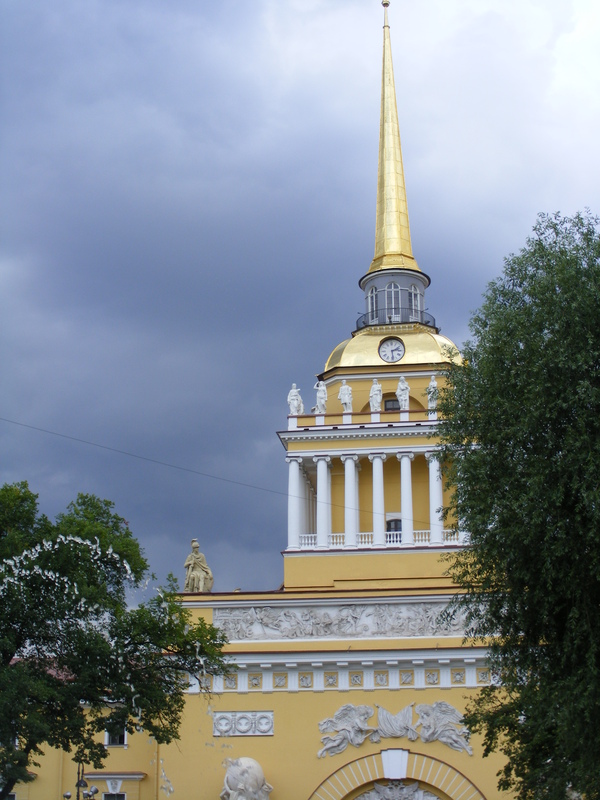 The enormous, yellow-painted admiralty building, indicates just how important this was. Peter is also credited with introducing a more western style of dress. Peter established the first museum in the city, known as ‘The Chamber of Curiosities’; allegedly visitors often required a stiff vodka to recuperate after a visit. The golden spire of the St. Peter and St. Paul cathedral is clearly visible. It was designed by an Italian architect, Domenico Trezzini and no one is allowed to build anything higher in the vicinity. I am impressed by the flashing light strips at the kerb side, which replicate the colours of the ‘little green men’, indicating when it is appropriate to cross. Some of our party do not seem to have grasped the idea that a ‘walking tour of St. Petersburg’ means they have to put one foot in front of the other and are complaining after the first 500 yards. We see the famous Winter Palace at Palace Square, the winter residence for the royal family from its construction in 1756 until the revolution. It is the third palace to be built on this site and has over 1000 rooms. We enter a tourist shops with Matryoshka dolls, decorated eggs, amber and too few toilets. Thunder has been threatening and a severe storm converts our walking tour to a coach tour, which is a shame from the point of view of photography. Trying to photograph lightening, of which there is a great deal, behind St. Peter and St. Paul’s spire is as tricky as photographing whales and one’s shutter clicks just after every flash. There are some depressing run-down flats on way back to port, highlighting Russia‘s contrasts. We have been warned of pickpockets on this trip and we see several ‘working girls’ on street corners. Back on board I feel obliged to sample 3½ desserts in the buffet dining room on deck 14, which we prefer to the more formal waiter service. Not only is there more choice but portion size can be controlled. Chris does somehow manage to press the emergency button in lift on the way back down. He reassures the anxious enquirer over the tannoy that all is well but I wonder how they know I am not being held at knife point. This evening’s talk is an informative session from Helen Smith on researching Australian and New Zealand WW1 soldiers. Today our guide on ‘Orange 19’ is Julia, who arranges our tickets in a rather OCD-like neat fan, as she collects them. We drive to get our boat for our trip on the canals. 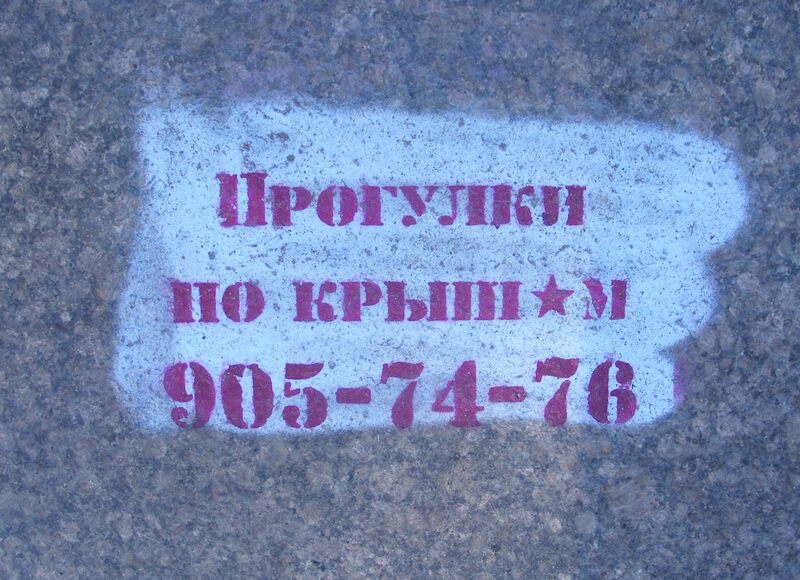 As we walk through the city, I am fascinated by the spray-painted, stencilled adverts on the pavements. Arriving at the wharf by Trinity Pier there is no sign of our boat. Heated conversations in Russian ensue and plans and explanations change by the minute. The boat is in the wrong place because of last night’s storm. The boat has broken down. We will wait, we will drive to another pier, no we will wait. To allay grumblings amongst some potential passengers, Julia walks us across to see the Summer Gardens, created in 1704, whilst we wait. This is not the hapless Julia’s day, as they turn out to be closed. There is only so much that poor Julia can tell us about what we can see from the quay at Trinity Pier, which was constructed in 1903 by the same company that built the Eiffel Tower. Finally, not but one but two boats arrive and we need to cross the first to reach the second. This is done by means of some decidedly Heath-Robinson gangplanks, with no hand rails. As we are amongst the most agile of our party, this is interesting. At last, we are afloat on the River Neva, which is 74 km long and 11-24km deep with 21 drawbridges. During severe floods of 1777 and 1824 the river level was raised by 4 metres. Julia’s day does not improve as one of the passengers get stuck in the boat’s toilet. Passenger duly released by a crew member, we journey up Fountain River past the Summer Gardens. The garden’s marble statues are dismantled each winter to preserve them from the weather. We travel along the Winter Canal and the Moika River, which was specifically designated for laundry. Contrary to yesterday’s information, today’s version is that vodka was used as an inducement to persuade people to enter the Chamber of Curiosities, rather than an aid to recovery afterwards. The dry land part of our trip takes us to the St. Peter and St. Paul Bastion, built on Hare Island in the Neva delta in 1703. The Trubetskoy Bastion section was a political prison until the C20th and prisoners included Fyodor Dostoevsky, Maxim Gorky and Leon Trotsky. The Cathedral was built in 1712 to Tressini’s design to commemorate victory over Sweden. Unusually the bell tower is integral to the church, whereas they are normally a separate structure. This makes the cathedral the tallest orthodox church in the world. Inside are the tombs of the royal family, including Peter the great, Nicholas II and Catherine the Great. We also see the memorials to the hapless Romanovs, whose remains were exhumed and identified by DNA. This evening’s entertainment is a session on British and Irish Newspapers by Chris Paton. The new Faberge Museum and an evening at the Russian ballet would have been something great to see as well!